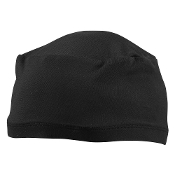 Nylon/Spandex fabric will fit any head and can be worn on hot or cold days. Elastic/Silicone beaded brow band insuring reliable comfortable fit. Machine washable.